Remember the Volvo 740 Turbo station wagon I wrote about a week or so ago? There are 12 hours left to the auction and it's at over $13,000.00. It is a really nice car, but at that price it's not very practical to use as it was intended to be used. You're not going to throw car parts, bags of fertilizer, whatever, in the back of an 18,000 mile, 20 year old classic Volvo. Especially one you've just paid well over top dollar for. The 540i Touring is about as close to an M5 station wagon as you'll get. The amazing DOHC BMW V8 puts out 282 HP. It's mated to BMW's Steptronic transmission, which can be used as a regular automatic transmission or, when in "M" mode, as manual shift transmission. 0-60 is in the 6 second range. This, being BMWs top of the line wagon, comes with every amenity you could imagine. 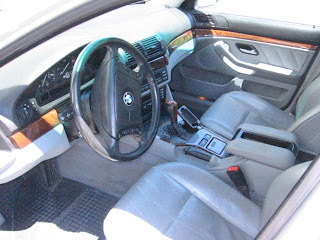 Being a 1999, what it doesn't come with, fortunately, is BMWs "iDrive". The controls are well laid out and easy to understand. This car has been fitted with an "I-Simple" Ipod dock, something I just saw for the first time this weekend in a friend's car and something that should be in every car. It's a really cool set up for someone who loves music. This car is owned by a "BWM Master Certified Motorcycle Tech" and has been very well maintained. He added an M-Sport front bumper and driving lights, which makes this one of the most - if not the most - aggressive looking station wagons I've ever seen. I like station wagons. I take some sh*t for that from a few friends. You know, the whole soccer mom image of a station wagon and all that. There is nothing "soccer momish" about a 540i wagon. It will out accelerate, out handle just about any car on the road and yet you can still load the back with "stuff". It doesn't get any better than that. Recently I've found myself writing about many cars that you couldn't realistically drive everyday. This is one that you could and should use on a daily basis. Located in Raleigh, NC, click here to see the Craigslist listing for this 1999 540i Touring. 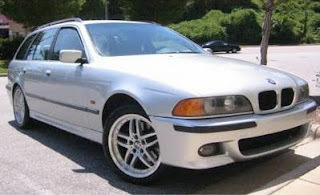 Click here to see an Edmunds review of the 1999 540i Touring. I'm with you on the station wagon lust, we're a misunderstood bunch. This is a great car, I often think that is gen of the 5-series and the same time-period 7-series are the epitome of BMW design. The ergonomics, performance, and simple styling are top-notch. Had a '99 740is a few years back and have driven more than a few 5ers, and the wagon is stylish and super-practical with a killer engine. Great buy, especially mechanic-owned. The mileage is no problem on this car either. Great options, too. It's not a Sport, but it has the sport's transmission and the non's steering wheel is better. All you're missing is shadowline window trim and bolstered seats (which wear out quicker).